iMacsoft DVD Ripper is powerful and easy-to-use DVD Ripper Review designed just for Windows users to rip and convert DVDs including DVD-9, DVD-5 and IFO image files to all popular video and audio formats for playback on iPad, iPhone, iPod, Apple TV, PSP, PS3, Zune, Xbox 360, Pocket PC, PDA, Mobile Phone, BlackBerry, Archos, Archos AV500, Archos AV700, Archos GMini402, iRiver PMP-100, Creative Zen Vision, etc. multimedia portable devices. This best DVD Ripping software can rip DVD movie to almost all popular video formats such as WMV, 3GP, AVI, MPEG4, RM, DivX, MOV, XviD, FLV, SWF, etc. and rip DVD audio to almost audio formats including AC3, M4A, MP3, WMA, WAV, AAC, etc. with super fast DVD ripping speed and excellent quality! Among all the DVD Ripper software, iMacsoft DVD Ripper is remarkable with its super high DVD Ripping speed and excellent quality. 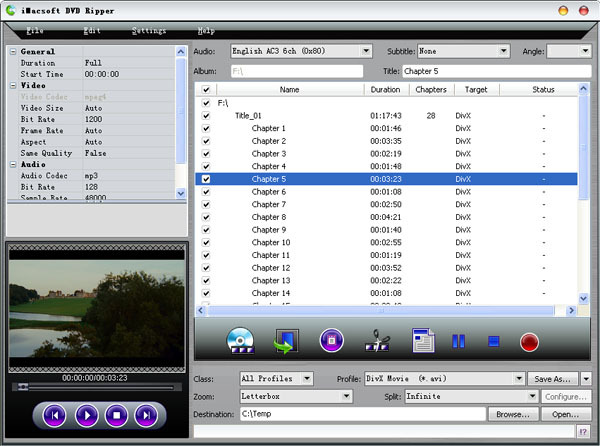 It supports various functions which allow you to trim video, customize and split output file size, rip DVD's any titles and chapters, select Subtitle and Audio Track, set Bit Rate, Resolution, and Frame Rate, etc. Free download iMacsoft DVD Ripper now and to enrich your digital life with this fantastic DVD Ripper. How to rip DVD to MPEG-4 files for playback on iPod? How to rip DVD to Hard Drive for backup? How to convert DVD to QuickTime video files? How to convert movie DVD to YouTube videos? How to put DVD on iTunes library? How to convert DVD to AVI video files? How to rip DVD movies, watch DVD movies on PSP/iPad/iPhone/iPod? How to convert DVD to WMV video files, play the DVD with Windows Media Player? How to convert DVD movie to MP4 files that can be popularly used in digital life?